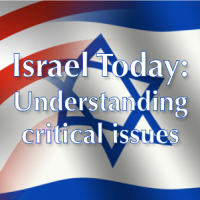 A more in-depth discussion of this topic is available in Dr. Dean's Zionism series. 05 - What in the World is BDS and Why Should I Care? Make sure to visit the StandWithUs website to access the free materials they have available about BDS, Answering Tough Questions About Israel, and other booklets that Vida and Jesse referenced during their presentations. The video that was included in Vida's presentation is available by clicking the "Transcript: notes" link below. It is a rather large PDF file (73 MB) that you will need to download to your computer's hard drive in order to play it. Click on the play button in the lower left corner of the second page to play the video. This rousing video was shown to close out the Israel Today conference. It was produced by Ephraim Kaye. To purchase this video, please contact Ephraim at .